There’s a great debate on our hands people, you’re either one way or another. You either drench your Thanksgiving plate in gravy or cranberry sauce. Take a stand. 🙂 Myself, I choose to be on the cranberry sauce side which is actually surprising to me because I often choose salty over sweet. 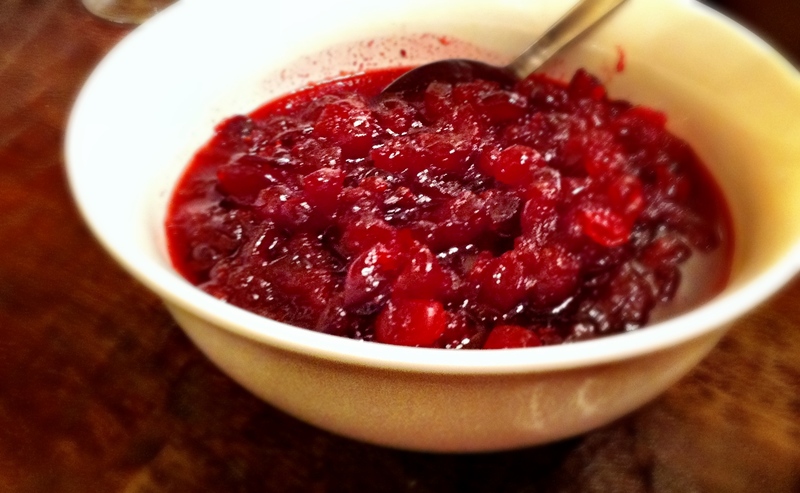 I think the reason cranberry sauce has my allegiance is because cranberries have that perfect marriage of bitter and sweet that I can’t help but surrender to. I know that it seems so much easier to just open a can or pop open a jar of this delicacy but please for your taste buds’ sake do yourself a favor and spend the 15 minutes or so to make your own this holiday season, it’s mind-blowingly simple. You’ll thank me later. In a medium-sized pot combine cranberries, sugar and water. Stir frequently and bring to a boil then reduce to simmer. Add cinnamon stick, allspice, nutmeg, and ginger. Allow to simmer for 5-7 minutes and stir occasionally. Add the orange zest and juice, stir and cook before serving.